- fares for a connection. From single ticket to prices for a weekly ticket. - The "bring me home" feature will search a connection from your current location to a chosen home address. - Connection favourites can be pinned to the phone's start screen. 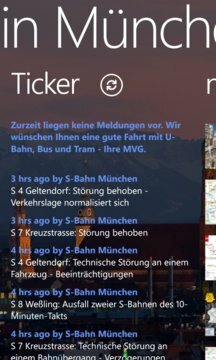 - Stations can be pinned to the phone's start screen. This will bring you directly to the departure times. You don't know which station you should head to? No problem, just use your current location or enter an address. Fahr in München knows how to take you to your destination. 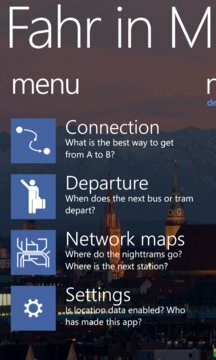 It even gives you the walking directions from the station to your final destination.